Organized by Random Tuesday, INC.
Are you ready to be strong? All funds raised will go directly to Random Tuesday, Inc .
Fandom Running Club is pleased to re-release the first event in The Slayer Series: The Chosen Run 5k! You've demanded it and now we're doing it! We're re-releasing the inaugural event of the Slayer Series and you didn't even have to get Willow to cast a spell to get it! For the first event in the Slayer Serie ,  e decided to start at the end. The Mʔ...the Scythe...whatever you want to call it, it's the ultimate weapon if you're a Slayer and you need to kill the First Evil...or a sadistic preacher (bye, bye Caleb!). Willow used it to activate all potential Slayers so they could fight the evil of the Hellmouth. It's simply brilliant! Your registration includes this incredible 3" two-sided medal featuring the Scythe with the call to every potential Slayer, sublimated ribbon, and a personalized digital bib! And since we're re-releasing these medals, we decided that this is a good time to do a cool event shirt! The question on the shirt is simple, but carries so much meaning. 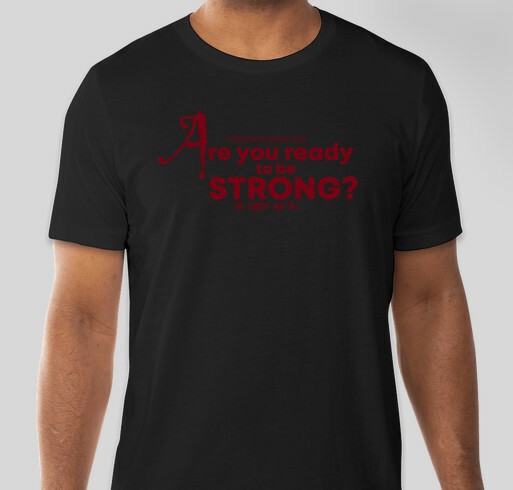 Are you ready to be strong? It's time to Run! Fandom Running Club is a registered 501(c)3 non-profit dedicated to changing the muggle world, one mile at a time. Join us on Facebook or on our website. Share Why You Support "Slayer Series - The Chosen Run 5k"